Back in January, Lucy from Capture by Lucy thought up a lovely idea for people of the blogging and social media community to do something nice... just because! I loved the concept of putting together a gift for a stranger and was one of over 200 people who signed up for the #SpringtimeSurpriseproject. In February we received our partner's details and it was time to start thinking about the gifts that we would send them. The idea behind the project was using a modest budget (the guide price was £5) along with lots of thought to create something that would make the recipient smile. As this is a Spring time project, we were to make sure that our gifts arrive ready for the Spring Equinox on the 20th March 2015. As well as the address of where to send our parcel we were sent a few lines detailing the likes and dislikes of the person we were creating a gift for. My partner's name is Amanda and I learnt that she has a deep love of Africa, a passion for reading. vintage photo frames, all things dusky pink, wisteria and good coffee. 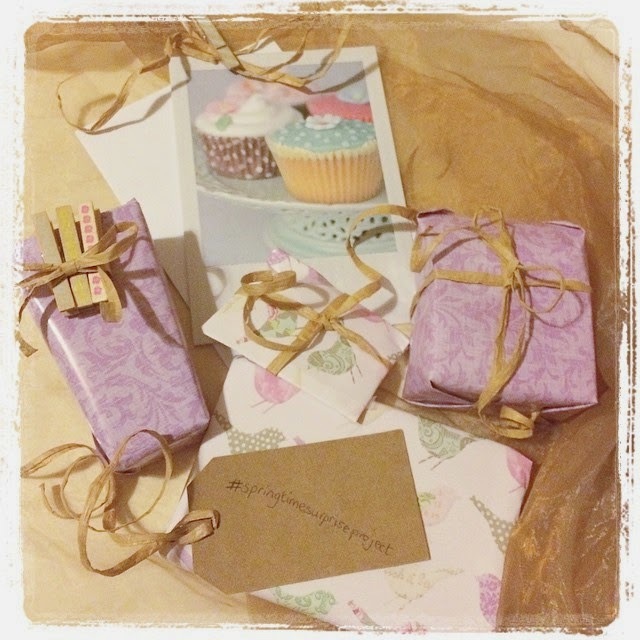 I'm not going to give away what I bought just yet, but as I found the last item for my parcel yesterday at a local craft fair, I thought i'd share a sneak peek of my parcels all wrapped up before I post them in the morning. I've really enjoyed putting the gift together and I hope that my swap partner likes her little presents.